Reckless Lake and Reckless Gate are mentioned from the 1589 Terrier until Victorian times. Reckless Lake was clearly the name of a large field and it is thought that Reckless Gate was, perhaps, the gate leading to the field - most likely at the location where the later track leading to the Isolation Hospital met Meadway (today's Lyde Road), shown on the last of the maps below. 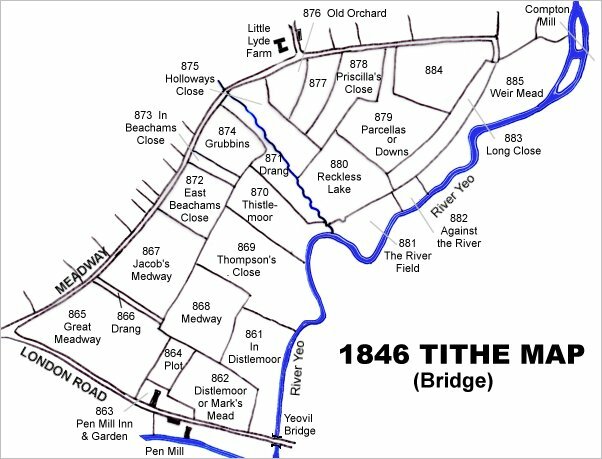 The 1589 Terrier indicates the three great fields - west, middle and east - as shown on the map below. 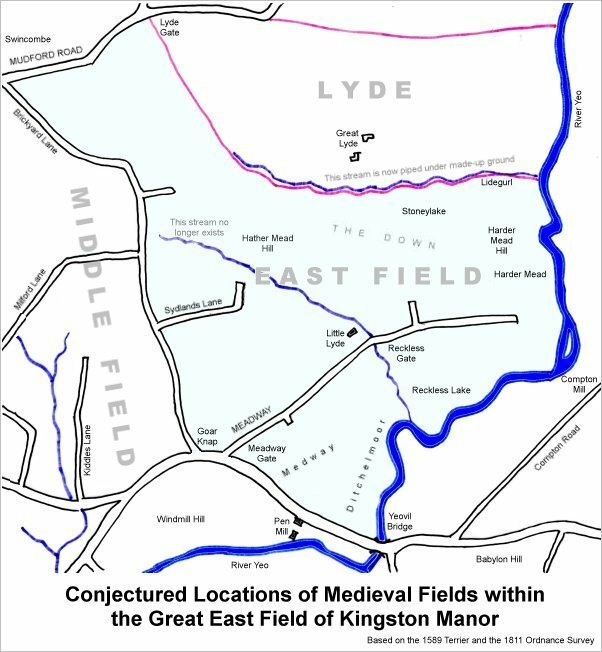 In describing the boundary of East Field it mentions Reckless Gate as follows "Eastfields from Meadway Gate the lower part of the way, unto Reckless gate and from thence to the great river and up to Yeo. Bridge.... from Reckless Lake in the outer part of the Meadway....". At one time therefore, Reckless Lake was a fairly large field stretching all the way across from Meadway to the River Yeo. Although generally speaking it is originally thought to have been primarily in the area of today's Buckland Road, it clearly stretched north as far as Lyde at one time since in his will of 1828 William Row stated "all that my Close of Meadow Ground called Radclisse [ie Reckless] Lake now an orchard adjoining my dwellinghouse at Lyde with the strip of Ground at the West End thereof now divided therefrom (a part of which Close is now enclosed with my Garden at Lyde) together with the Crib house erected thereon which I purchased of the Heirs at Law of my late uncle Tanner containing about five acres with the rights chambers and appurtenances to the same belonging". By the time of the 1842 Tithe Map the former large field had been subdivided into many much smaller fields only one of which retained the name Reckless Lake. 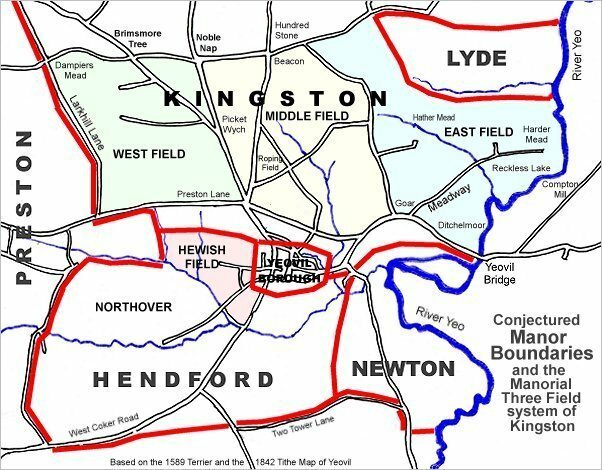 It lay south-east from Little Lyde and the 1846 Tithe Apportionment recorded Reckless Lake (Parcel 880) as pasture, owned by William Jones Prowse (Lord of Kingston Manor at that time) and the tenant was Thomas Frost. The Apportionment noted that it measured 5a 1 20p. Reckless Lake was bounded on the northwest by Holloway's Close (Parcel 875) and Priscilla's Close (Parcel 878), on the southwest by a small brook which is no longer evident above ground and is, presumably, piped underground, on the southeast by The River Field (Parcel 881) and on the northeast by Long Close (Parcel 883) and Parcellas (Parcel 879). A Counterpart of Lease for seven years dated 25 March 1859 between Captain William Prowse of Enham House, Southampton, Retired Captain RN, and John Stone of Pen Mill Inn for both the inn and the adjoining farm, included 'Reckless Lake (Parcel 880). The lease noted that the field was used as pasture for grazing and measured 4a 3r 22p - the difference in area between this and the Tithe Apportionment most likely due to the use of 'Statute' measurements in the Apportionment which were actually different to 'Customary' measurements, even though both used the same named units of area measure. Today the railway runs across what would have been the southeastern end of Reckless Lake while the remainder is covered with buildings of the Pen Mill Trading Estate on the south side of Buckland Road about halfway along. 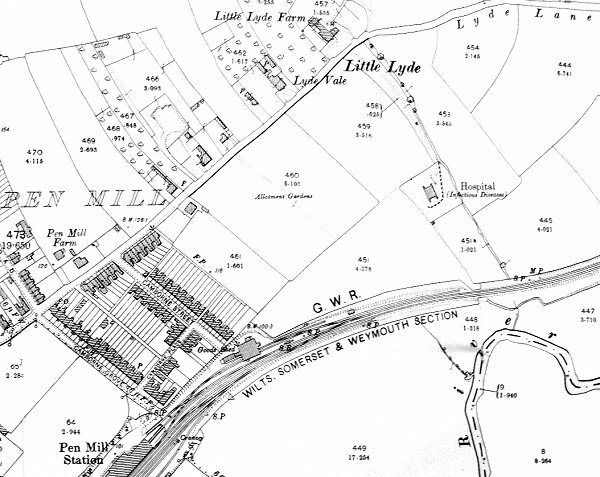 On this 1901 Ordnance Survey Little Lyde is the area shown at top. Reckless Gate was most likely where the track leading to the Isolation Hospital joined Lyde Lane just above the words 'Little Lyde'. Reckless Lake was most likely the fields running from Little Lyde beyond the railway tracks to the River Yeo at bottom left.